Tempe Beach Park and Tempe Town Lake are adjacent to one another, located in downtown Tempe, Arizona, not far from Downtown Phoenix and Sky Harbor International Airport. You can take a tour of Tempe Town Lake on a Segway or rent various kinds of personal watercraft for some urban recreation. The address of the Tempe Town Lake Operations Center and Marina (north side of the lake) is 620 N. Mill Avenue. The address for Tempe Beach Park (south side of the lake) is 80 W Rio Salado Pkwy. Tempe City Hall is just a few short blocks away at 31 East 5th Street. South Bank - Tempe Beach Park - Tempe Beach Park at Tempe Town Lake is where many of the events, concerts, and festivals are held. The amphitheater is on the south bank. Tempe Beach Park is on the Rio Salado Parkway. From the Loop 202 (Red Mountain Freeway) you can exit at either Priest (west side) or Rural (east side) and travel south to the Rio Salado Parkway. North Bank - Town Lake Marina - You'll want to get to the north bank if you want to launch a boat or use the pedestrian, biking, and skating pathways located on the north side of Tempe Town Lake. The operations center is located on this side. Take the Loop 202 (Red Mountain Freeway) east to the Priest/Center Parkway exit. Exit north (left), cross the freeway overpass and turn east (right) on Washington Street. Look for the Marquee Theater on the south side of the road, and go into that parking lot to find the Operations Center under the freeway. Parking - Parking at Tempe Town Lake can be confusing. There are some free lots and some pay lots, and of course, any spot you can find in downtown Tempe around Mill Avenue. You can also park on the north bank, where the parking is usually free, and walk across the bridge to the south bank. Specifics about parking lots and garages nearby can be found at the Downtown Tempe website. Mill Avenue is a vibrant area in Downtown Tempe. Restaurants, nightlife, shops, and Sun Devil Stadium are are all part of the Mill Avenue downtown district in Tempe. Many popular events are held on Mill Avenue, including the semi-annual Tempe Festival of the Arts, Tempe Festival of Lights Parade, the Buffalo Wild Wings Bowl, and the New Year's Eve Celebration. Also within a few blocks is the main Arizona State University campus, including ASU Gammage. From Sky Harbor International Airport - Take Loop 202 (Red Mountain Freeway) and exit at Priest Drive. Turn south (right) on Priest, east (left) on Rio Salado Parkway, and then south (right on) Mill Avenue. From the southeast - Take the Price Freeway 101 Loop north to the Red Mountain Freeway Loop 202. Go west on the 202 toward Phoenix. Exit at Rural Road and make a left (south) to Rio Salado Parkway. Make a right (west) on Rio Salado to Mill Avenue and make a left (south). Or take US60 Superstition Freeway to Mill Avenue exit. Drive south on Mill Avenue. From the south - Take I-10 west towards Phoenix. Exit at 143 Hohokam Expy, and take that to the University Exit. Go east (right) on University to Mill Avenue and make a left (north) on Mill. From the north - Take SR51 to the Loop 202 Red Mountain Freeway. Go east on the 202. Exit at Priest Road and make a right (south) to Rio Salado Parkway. Make a left (east) on Rio Salado to Mill Avenue and make a right (south). 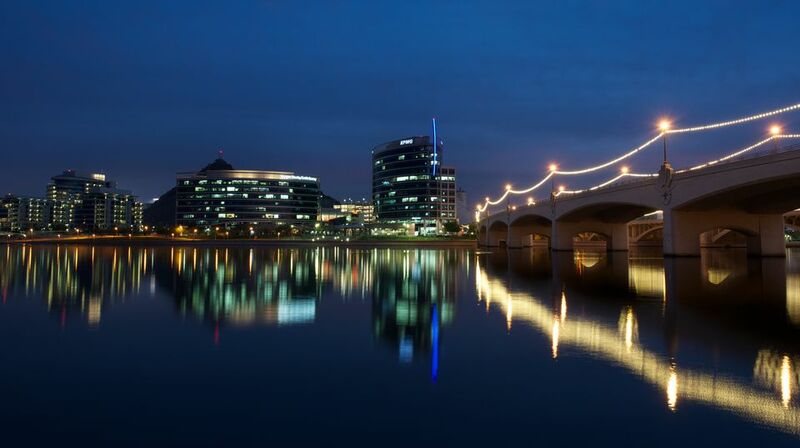 Downtown Tempe, Tempe Beach Park, and Tempe Town Lake are accessible by light rail. The closest station is Mill Avenue and Third Street. Boating in Tempe, Arizona? You Betcha! Need a Place to Stay Near A.S.U? Here Are Your Choices. We Have Three LDS Temples in Greater Phoenix. Here's How to Find Them.